"Traveling. It leaves you speechless, then turns you into a storyteller." 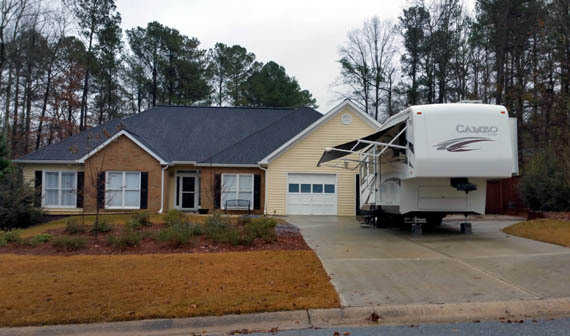 As I explained in one of the 2018 entries, it took us 20 months to get back out on the road again for another one of our "winter trips" in our Cameo 5th-wheel coach. 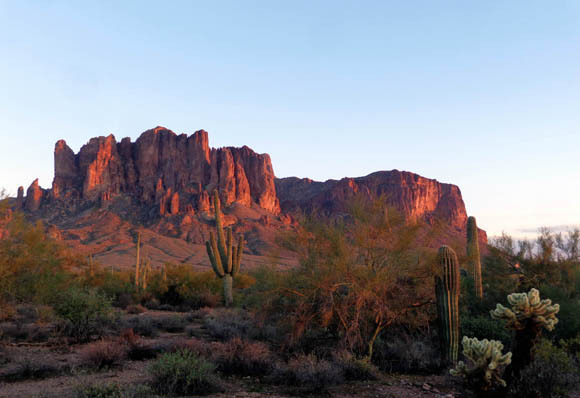 Jim's desire to walk 100 miles at Across the Years 48-hour race in Phoenix was the motivation. Since it's so far to drive out there from Georgia, we decided to extend the trip to about two months and visit some of our favorite winter destinations where we haven't been for several years. We also spiced it up with a couple new places where we haven't camped previously. As soon as we could reserve sites -- most were six months in advance -- we made campground reservations at several regional and state parks and one military base for this trip. It has become even more difficult to reserve good sites than it was when we temporarily stopped traveling almost two years ago, so our choices were somewhat limited by that. 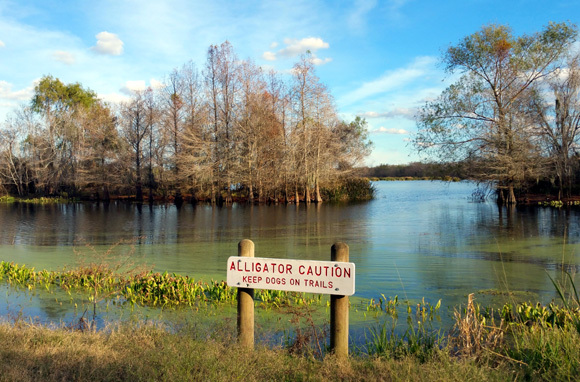 Some are places where we've stayed before, but not for several years -- Brazos Bend State Park in Texas, McDowell Mountain Regional Park near Phoenix, Nellis AFB in N. Las Vegas. 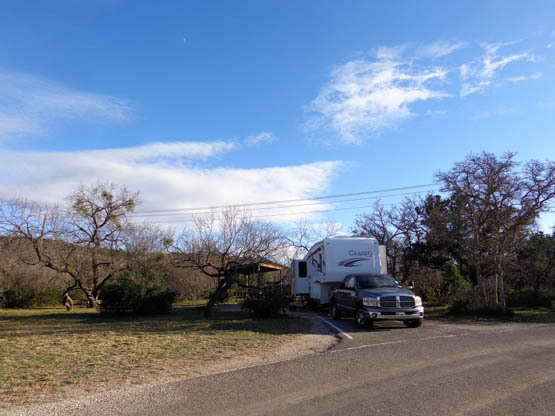 We also found a new place almost on the spur of the moment as we were traveling through Texas outbound and were trying to avoid high winds on I-10 -- South Llano River State Park, where we stayed just overnight. 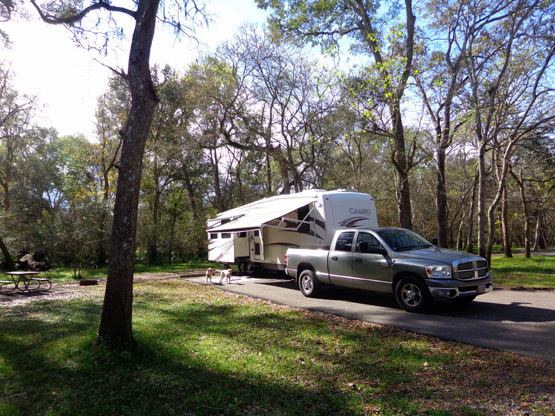 It's easier to be spontaneous like that during a season when a campground either isn't very busy or in a real popular area. 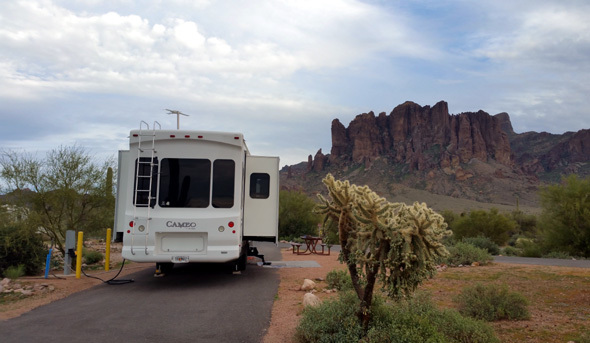 We couldn't have gotten a site large enough for our RV at Lost Dutchman if we'd just showed up there like we did at S. Llano River. The sites with hookups at Lost Dutchman were full the whole time we were there. We haven't said that for a while. We were a little out of practice but we've done this so many, many times since 2004 that the routines and procedures came back pretty fast. This was our third and shortest visit to this park. It was good to be back after seven years but it just wasn't the same in December as it was the two previous times we stayed there in February and March when everything was green and more flowers were in bloom. We were campground hosts for several weeks in both 2010 and 2011, so we really got to know the place back then. We were a bit disappointed this time. 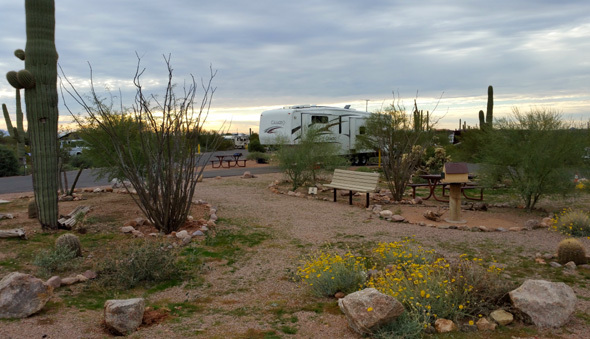 But that's another reason we temporarily stopped RVing in early 2017 -- subsequent visits to favorite destinations were usually not as interesting as our first time there! 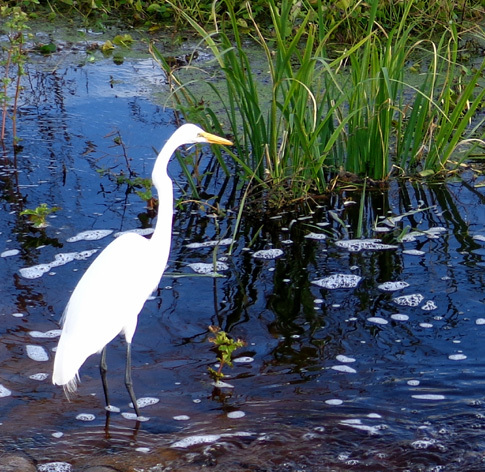 sunning themselves on the banks of the lakes or out on the narrow islands. In addition, this part of Texas got a LOT of rain in 2018, much of it right before we arrived. The Brazos River was flooded, much higher than we've ever seen it, and at least half of the trails were closed because of too much water and/or mud. That seriously limited our hiking options. 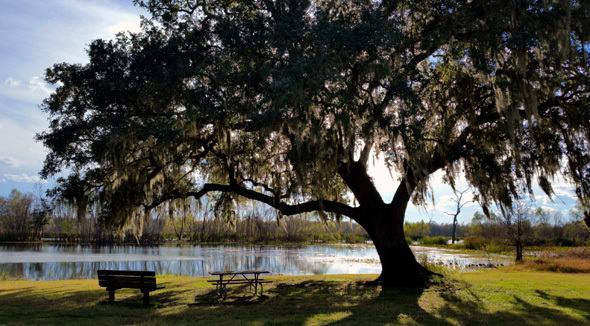 I concluded, however, that Brazos Bend was still one of the nicer places to visit in December when you compare it to the weather in the rest of the country during the winter! And I proceeded to show lots of pictures of the wildlife, lakes, and other scenery on two journal pages. 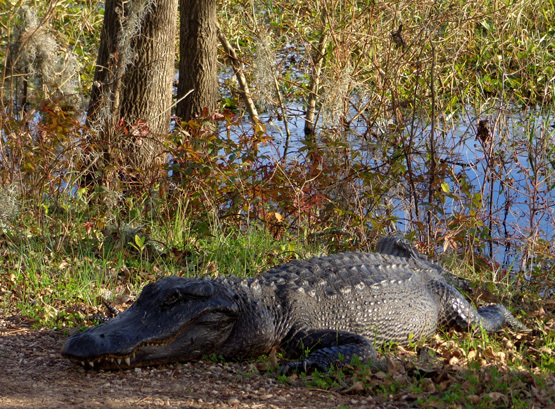 We made the only real spontaneous decision about where to camp overnight when we left Brazos Bend. That was due to high-wind warnings along I-10 west of Houston. 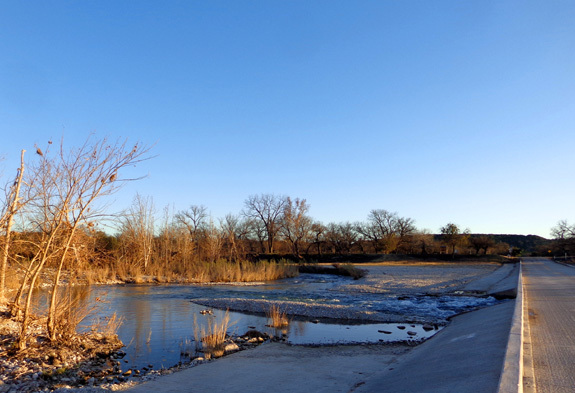 We decreased our mileage that day and got a site in another park farther west in Texas where we've never stayed before, South Llano River State Park. The river was pretty low under the entrance road to the park. 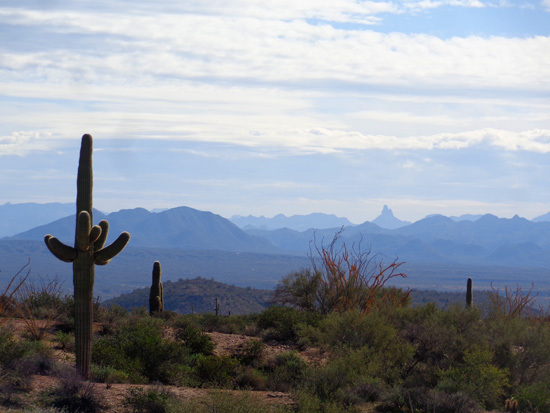 After two more days of driving we arrived at Lost Dutchman State Park near Apache Junction, Arizona (east metro Phoenix). This was also a new park to us and we really enjoyed our weeklong stay. 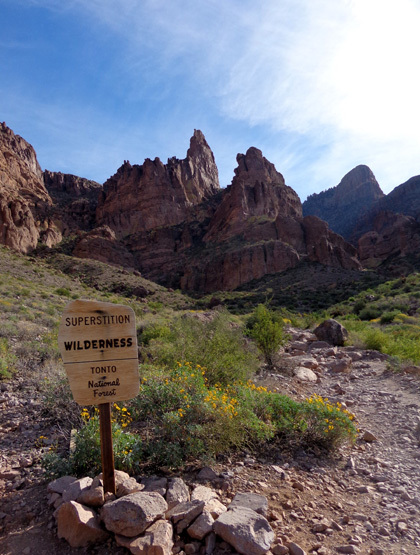 I showed our large pull-through site near the top of this entry, with fabulous views of the Superstition Mountains to the south, the Four Peaks Wilderness to the east, and the Gold Vein Range to the north. Our campsite at Lost Dutchman was right next to this attractive desert garden. While we were at the park we walked and drove by all the sites in the campground and decided the one we picked was the very best! We had fun hiking all the nearby foot trails with the dogs . 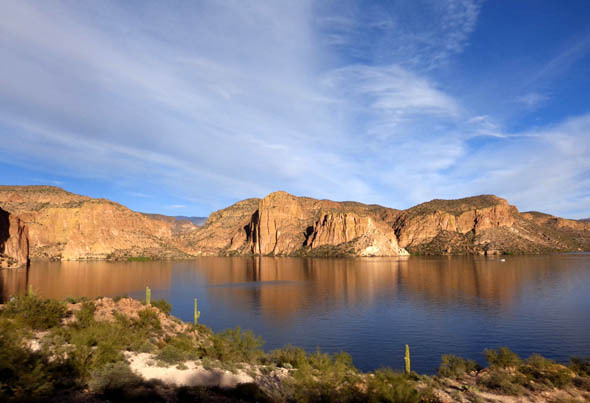 . .
Our next destination was fairly close to Lost Dutchman and one of our favorites since we first camped there in 2004 -- McDowell Mountain Regional Park near Fountain Hills, also east of Phoenix. 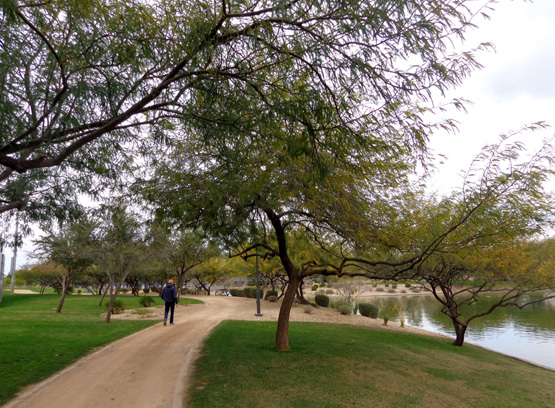 Although this was at least our sixth time camping at McDowell Mountain, we hadn't been there for eight years so it wasn't the same 'ole, same 'ole feeling we've had some other places when we've done repeat visits. We stayed just three nights in December, then returned for another two weeks in January before heading back home to Georgia. 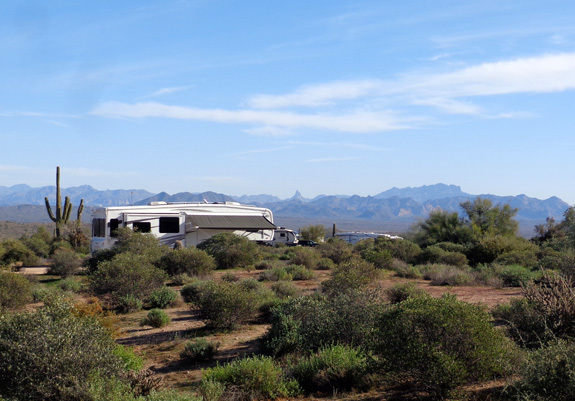 Our site at McDowell Mountain overlooked the iconic Four Peaks and Weaver's Needle. The Needle is in the center background, to the right of the front cap of our camper. We reserved the same site (photo above) that we've had previously, high up on the outside of one of the campground loops where we're close to the network of trails and with a wonderful panoramic view of all the surrounding mountain ranges. 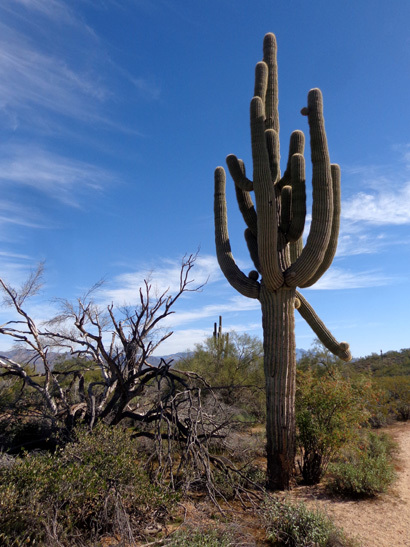 A very old saguaro cactus stands guard along one of the trails at McDowell Park. 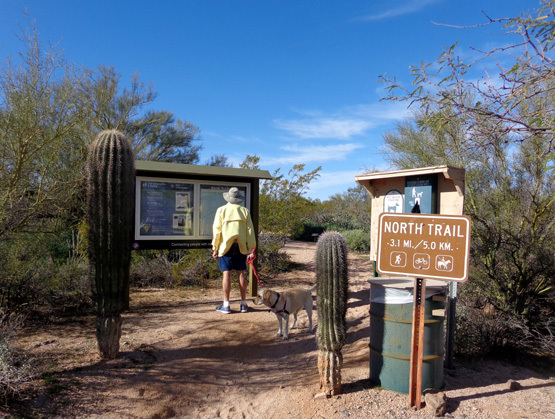 Several new trails have been built since we last visited McDowell Mountain but we didn't hike them until our longer visit in January. I'll have photos from those trails later in this year's journal. 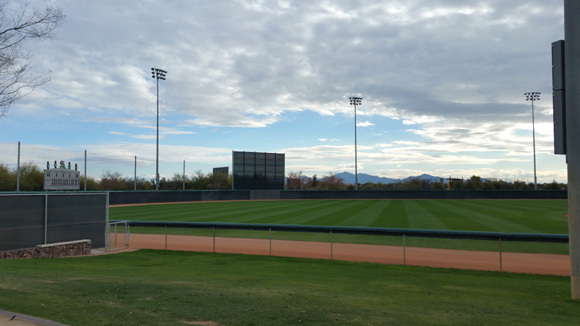 In late December we drove 60 miles to Camelback Ranch in Goodyear, a suburb in metro Phoenix, for the Across the Years (ATY) race where Jim walked 100 miles in about 43 hours at the beautiful venue where the Chicago White Sox and LA Dodgers do their spring training. Many of the participants in the 24-, 48-, 72-hour and six-day races stay overnight on-site in tents or RVs during the race. There were about 60 RVs in the huge south parking lot when we left on December 30, before the peak number of runners and walkers had even arrived (there's a big hoopla on New Year's Eve that we didn't stay for this time). 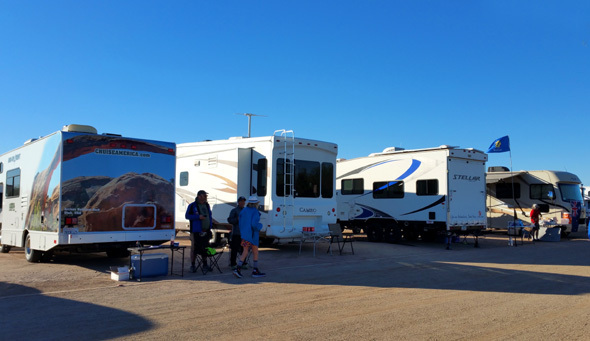 That's not the first time we've been able to park our camper next to or very near a race course, but it's certainly the only one we know of where so many RVs can park so close. When Jim was finished with his race he got a few hours sleep, then we drove to our next destination, Nellis AFB in N. Las Vegas, NV. That's where this winter's travel log continues.